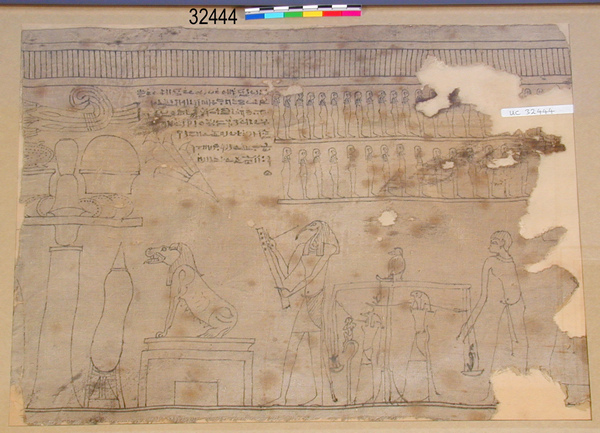 The Book of the Dead is the modern name for ancient Egyptian manuscripts containing compositions drawn from a repertoire of about 175 individual 'chapters'. 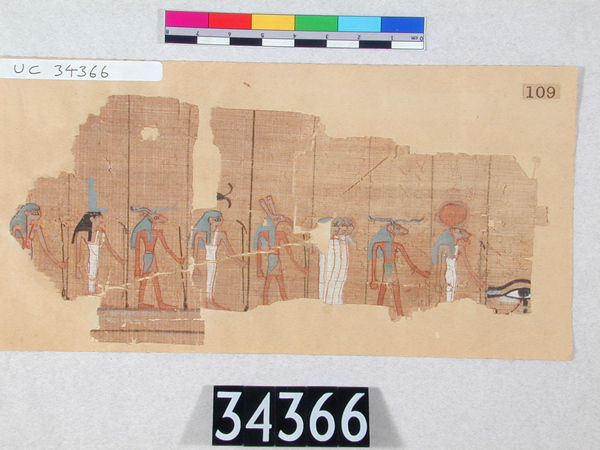 These were named by the Egyptian the 'chapters for coming forth by day'. The corpus derives in large part from the Middle Kingdom (about 2025-1700 BC) Coffin Texts, and appears first on coffins and shrouds of the royal family in the 17th Dynasty (1650-1550 BC); from the reign of Hatshepsut (about 1450 BC) until the Roman Period (after 30 BC) the Book of the Dead was included in numerous elite burials, written on papyrus rolls; in the 26th Dynasty the sequence of chapters was standardised into a series of over 150 'chapters', most with their own vignette. Individual chapters occur on other funerary equipment, such as the shabti, headrest, amulets, heart scarab, and also on the coffins, sarcophagi and walls of burial chambers and offering chapels (Forman/Quirke 1995: 183). 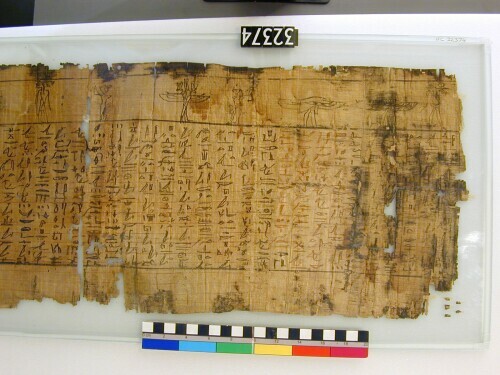 Among these, the Eighteenth Dynasty papyrus of Nebetawy from Abydos and the Nineteenth Dynasty papyri of Khnumemheb and Tjaymesu from Sedment are especially important, because few substantial papyrus manuscripts survive outside Thebes, and most of those are from the cemeteries of Memphis. 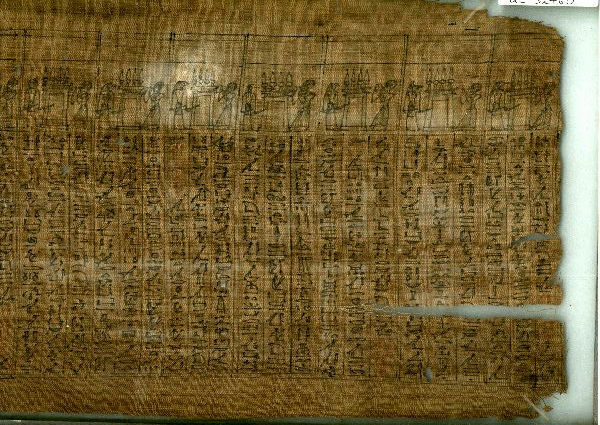 In the period 400-100 BC many elite burials at Memphis had Book of the Dead compositions written on the linen bandages wrapped around the mummy. (3) drafting the Book of the Dead? 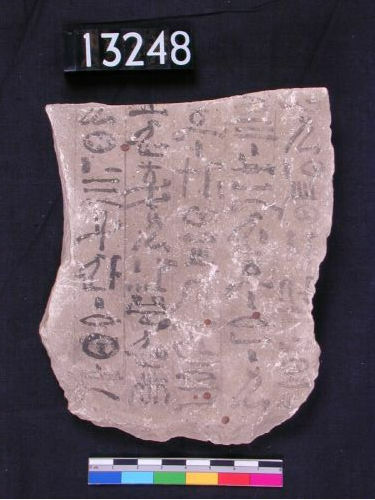 The Petrie Museum also preserves one ostracon (UC 13248) with parts of the opening phrases of Book of the Dead chapter 17. 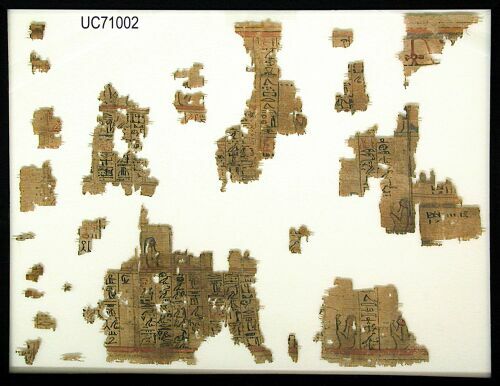 The Book of the Dead is rarely found on ostraca (flakes of limestone used as a cheap and convenient writing surface at Thebes in the Ramesside Period). This may have been a draft for working out the spacing of lines on a chapel wall or on an item of burial equipment, rather than being part of the preparation of a papyrus roll. However, the red points at intervals point in a different direction; such 'verse points' are also found on literary and religious compositions, and may indicate that this piece was intended to be recited in a ritual, perhaps during the embalming or funeral ceremonies, or in the cult of the dead. Copyright � 2002 University College London. All rights reserved.